These vegan cupcakes are delicious and easy to make! Perfect for Valentine’s Day, baby showers, or whenever you pink cupcakes are required! These are traditional golden vanilla cupcakes dyed pink with homemade beet food colouring. Oh and they’re vegan cupcakes, obviously. 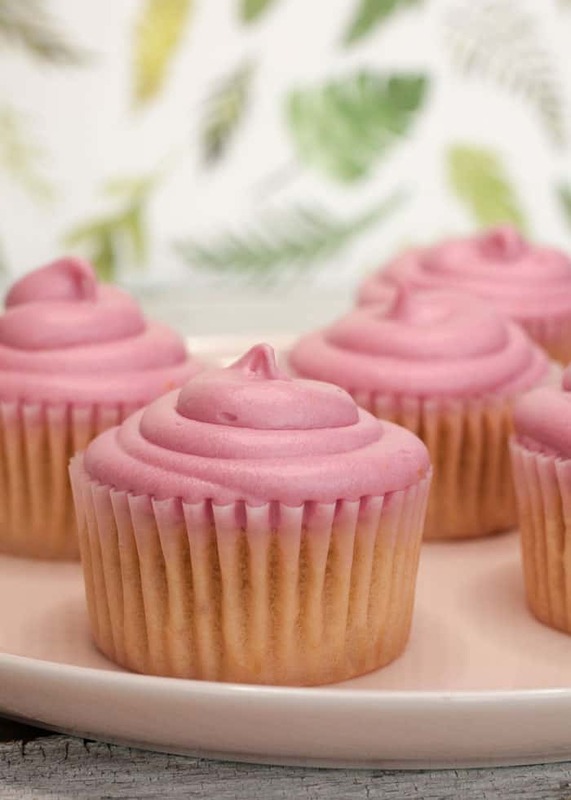 It’s really hard to find vegan food dye, and because I would rather not send you on a wild goose chase, I decided to dye these cupcakes with an ingredient we can all get our hands on; beets. So why don’t I used red food dye? And why isn’t red food dye vegan? Carmine, also known as; Cochineal, Crimson Lake, Carminic Acid, and Natural Red #4, a is a red dye derived from tiny red scale insects. Yuck, I don’ know about you, but I’d rather not have my cupcakes with a side of bug juice. There are so many natural and yummy ways to dye your food naturally, let me know if you’d like a full post on how I dye my food blue, green and even yellow, by leaving me a comment below. Valentine’s Day is just a few days away. Elaborate monetary gestures and flowers are great, but you know what really makes a special “I love you THIS much gift”? Homemade treats you baked with your own hands! At least that’s how it is around here. Personally, I HATE baking and decorating. I simply don’t have the patience or finesse for that type of thing. So, if you receive a plate or basket of homemade baked, and decorated sweet treats, you know that I think you’re [email protected]*$ing special! James and I have been apart for about 2 weeks, so I am really looking forward to this holiday this year. It’s been a busy year of book writing, learning how to be good dog parents, and wedding planning, that we haven’t had a lot of time for ourselves. We’re going to be making a serious effort this year, because love is an emotion that requires nurturing and constant attention. I am so excited to go out on Wednesday night and celebrate love with my husband, and not talk about the book, or our business together for the first time, in a long time. I will also be sharing stories and photos from our wedding and other adventures over on Instagram, so make sure you follow us if you want to learn more about our story. Okay, let’s get baking… To make the food colouring we are going to peel, and chop 1 small beet, and add it to a blender or food processor with 1 tbsp water. Blend it until you have a thick red pulp. If you’re having trouble blending, add more water, 1 tbsp at a time. Strain the beet pulp, using a fine mesh sieve or cheesecloth, over a glass bowl. Make sure you’re using glass because it will stain anything else. Discard the solids or save for a smoothie or juice, and use the juice for dying. Make healthy red and pink food colouring using beets! It's the easiest way to make food colouring at home! Peel, trim and chop 1 small beet. Add to a blender or food processor with 1 tbsp water and blend until you have a pulp. If you’re having trouble blending , add water, 1 tbsp at a time. Strain the beet puree, using a fine mesh sieve over a glass bowl. Discard the solids or save for a smoothie or juice. To make the cupcakes, start by preheating your oven to 350F and line a cupcake pan with cupcake liners. In a small bowl, whisk together 1 cup soy milk and 1 ½ tsp apple cider vinegar to make vegan homemade buttermilk. In a large mixing bowl, whisk together 1 ¼ cup flour, ¾ tsp baking powder, ½ tsp baking soda, and ¼ tsp salt. In a separate bowl or the bowl of a stand mixer, beat together the ½ cup sugar, ¼ cup vegan butter and 2 tbsp soft coconut oil. Beat in 2 tsp vanilla extract and the vegan soy buttermilk we made until well combined. Slowly beat the flour mixture into the wet mixture until well combined. Now, using an eye dropper or something else that allows you precise control, beat in drops of beet juice one drop at a time, until you reach your desired shade of pink. 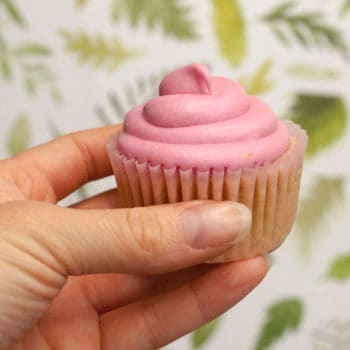 Scoop the batter into prepared cupcake liners, filling the cups ⅔ of the way full and bake for 20 mins, or until a toothpick comes out clean when inserted into the center. Remove the cupcakes from the oven and the cupcake pan, and allow them cool on a wire rack completely before icing. These vegan cupcakes are delicious and easy to make! Perfect for Valentine's Day, baby showers, or whenever you need pink cupcakes! These are traditional golden vegan cupcakes dyed pink with homemade beet food colouring. In a small bowl, whisk together soy milk and apple cider vinegar. Set aside. In a large mixing bowl, whisk together flour, baking powder, baking soda, and salt. Set Aside. In a separate bowl or the bowl of a stand mixer, beat together sugar, vegan butter and coconut oil until well combined. Beat in the vanilla extract and soy milk until well combined. Now, slowly beat in the flour mixture until well combined. Using an eye dropper or something else that allows you precise control, beat in drops of beet juice colouring, one drop at a time, until you reach your desired shade of pink. Using an ice cream scoop, scoop cake batter into the cupcake liners, and fill them ⅔ of the way full. Bake for 20 minutes, or until a toothpick comes out clean when inserted into the center. Remove cupcakes from the oven and let them cool completely on a wire rack before frosting. To make the vegan cream cheese frosting, beat 1 cup softened cream cheese and ¾ cup vegan butter in a medium mixing bowl or the bowl of your stand mixer, until smooth. Add the 1 ½ tsp vanilla extract, and 4 cups powdered sugar, 1 cup at a time, until smooth. Add the zest of lemon and drops of beet juice,and beat on high until light and fluffy. Add additional powdered sugar as needed to make a light and fluffy frosting. Pipe or dollop onto cooled cupcakes and decorate as desired. This fluffy vegan cream cheese frosting is perfect for icing cupcakes, cakes, cookies and anything else that needs frosting! In a medium mixing bowl or the bowl of your stand mixer, beat the cream cheese and vegan butter until smooth. Add the vanilla extract, and powdered sugar until smooth. Add lemon zest and drops of beet food dye and beat on high until light and fluffy. Add additional powdered sugar as needed to make a light and fluffy frosting. Pipe or dollop onto cooled cupcakes and decorate as desired. Just made these for Valentine’s Day tomorrow, and they are AMAZING! Just a heads up, this makes a huge amount of cream cheese frosting, I ended up having to double the cupcake batter to use it all up. Using beets to dye it worked so well and doesn’t leave behind any beet flavor. Best vegan cupcake recipe I’ve ever made, pretty fool proof! Thanks for the feedback Maya! So these colors are CURRENTLY being tested on animals or they were in the past? Because, like with beauty product ingredients, all ingredients were tested on animals at some point. Whether or not they are tested on animals now is another subject. It varies from product to product, but many mainstream companies are using animal tested colourings. Thank you for sharing the truth about the harmful effects of artificial coloring. I would love to see a full post about how to naturally create food coloring. I’m interested in how you make vegan blue, green and yellow die too!